Since my mom was in town last weekend we decided to make ravioli again. This time I used an extra cheese for the ravioli and a new sauce to top everything off. Check out my previous post for ravioli making instructions. It wasn’t as easy to make this time, for some reason. There was a lot of yelling and frustration at that stupid dough, but it tasted great in the end! We added about 1/4 cup fontina to the filling this time to really make it special. In 3 Tbsp of olive oil I sauteed 5 cloves of garlic with about 1 cup of pancetta. 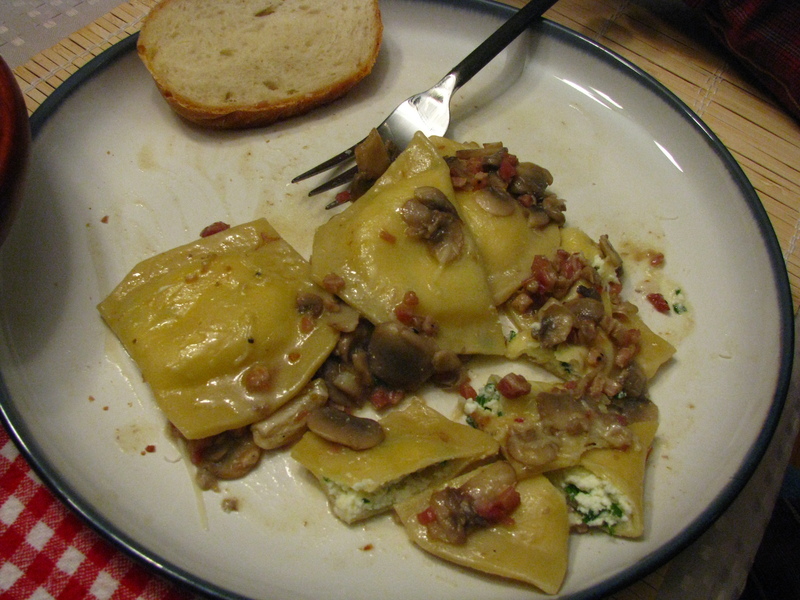 Once the pancetta was crisp I added about 3 cups of white mushrooms. Saute until the mushrooms have softened (about 5 minutes) and add 1 to 1 1/2 cups of chicken broth or stock. Cook until sauce is reduced by half. Add 4 Tbsp unsalted butter and cook, shaking the pan, until the sauce thickens and looks velvety. Transfer your cooked ravioli to the pot and cover with sauce. Serve with parmesan grated on top. We enjoyed our ravioli with some delicious bread with hunks of garlic inside from a local bakery and a fresh salad with balsamic vinaigrette. Our wine for the night was H3 Cabernet Sauvignon. Yum yum.